Ice-skating, shopping, the filming of America’s most famous shows — all this and more is happening at Rockefeller Center. NYC is home to magnificent skyscrapers, art deco buildings, and awe-inspiring vistas, and this plaza has all three in one place. A grouping of 19 different historic buildings, Rockefeller Center in New York City is jam-packed with some of the most beautiful attractions in the Big Apple. Why was it designed this way, and what is the unique history that brought this NYC landmark housing everything from Radio City Music Hall to NBC Studios to the iconic Rockefeller Center Top of the Rock observation deck to life? This “city within a city” has changed the way America sees itself, not just how tourists visit Manhattan. But with extreme ingenuity, extreme poverty, and extreme wealth all having an important stake in Rockefeller Center history, facts can sometimes feel like fiction, starting with the fact that the plans for this project were finalized just a day before the stock market crash of 1929. 1928: John D. Rockefeller Jr., an enormously wealthy financier and philanthropist, leases the property from Columbia University. 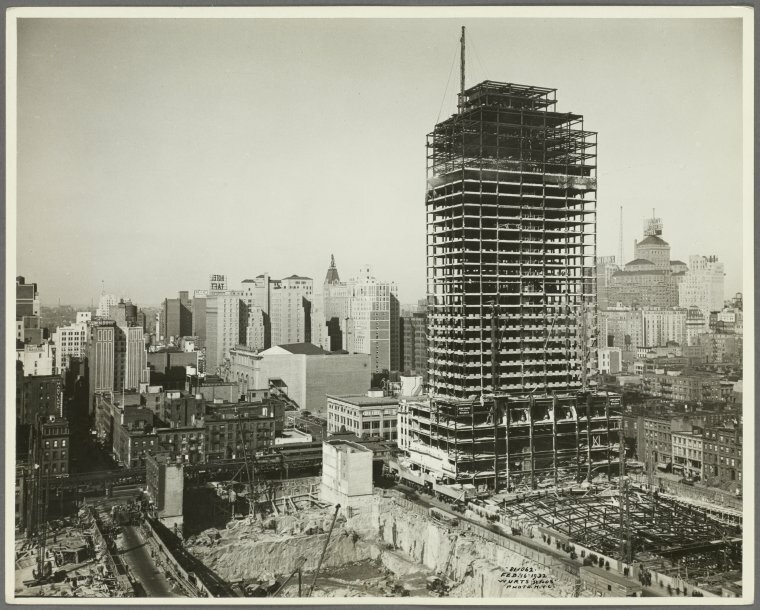 1929: The Metropolitan Opera, which was looking to build a new opera house in this location, pulls its funding because the new building is too expensive for the Met. 1929: The day before the stock market crash, architects Reinhard and Hofmeister are assigned to the urban renovation project. 1930: In a rush to make his property profitable, Rockefeller begins talks with RCA, NBC, and RKO to create a mass media complex. His new plans are devised within a month, and despite a few bumps in the road, like poor press and negative feedback, the design is pushed through. 1931: Construction officially begins on the first buildings: a music hall and the Center Theatre. Over the next few years, the project provides tens of thousands of jobs to local workers, who sorely need them due to the economic downturn. Caption: The full complex at 6th Avenue and West 50th Street is being worked on in 1932. 1931: Demolition workers pool their money to put up the first Christmas tree at Rockefeller Center. The first official Rockefeller Center Christmas tree would not come until 1933, after the center was opened to the public. 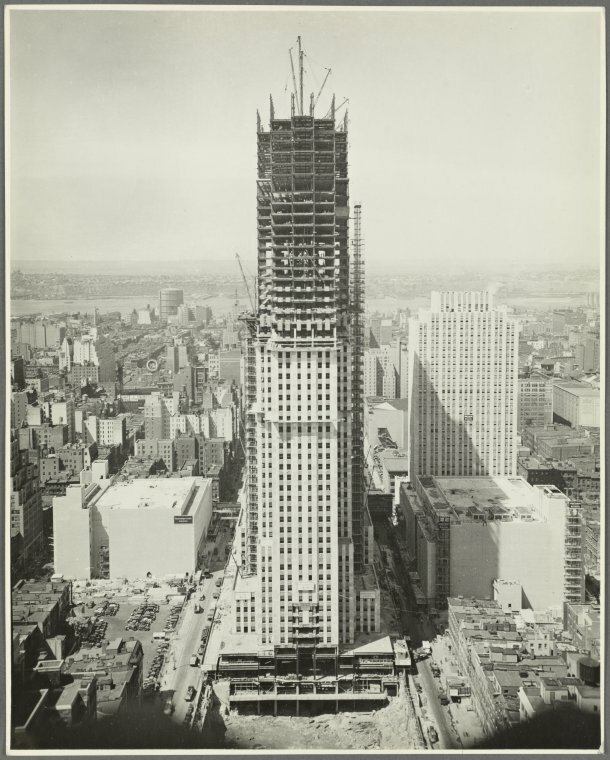 Caption: The historic building at 30 Rockefeller Plaza is under construction in 1932. 1933: The first buildings of the center officially open to the public on May 1st. 1933: The Top of the Rock attraction is introduced, which tourists love for its view of the Empire State Building. Today, the observation deck welcomes more than 3 million viewers per year. 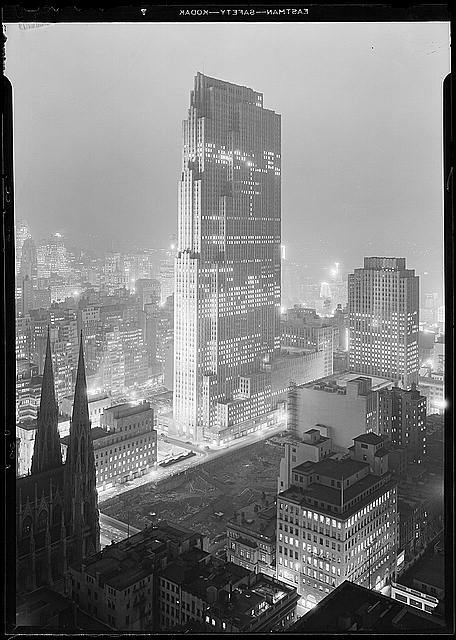 Caption: The finished RCA Building gleams at night in 1933. 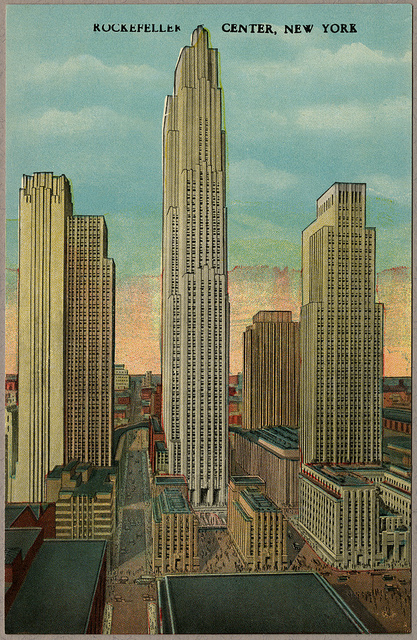 Caption: A postcard from the late 1930s depicts the finished building. 1933: The Man at the Crossroads fresco depicts the stresses of its day, including the choice between communism and capitalism. After a newspaper claims the art is “anti-capitalist propaganda,” the Rockefellers demand that artist Diego Rivera paint over the portrait of Lenin; Rivera refuses. The paining is plastered over and peeled away in 1934. Caption: The controversial Man at the Crossroads painting showing the pressures of one man choosing between capitalism and communism was destroyed by Nelson Rockefeller, son of John D. Rockefeller Jr. This is a re-created version of the painting: Man, Controller of the Universe. 1934: The now-world-famous Prometheus statue is constructed in the plaza. 1934: The Rainbow Room opens in the RCA Building, becoming a home for prestigious events that’s also known for its revolving dance floor. 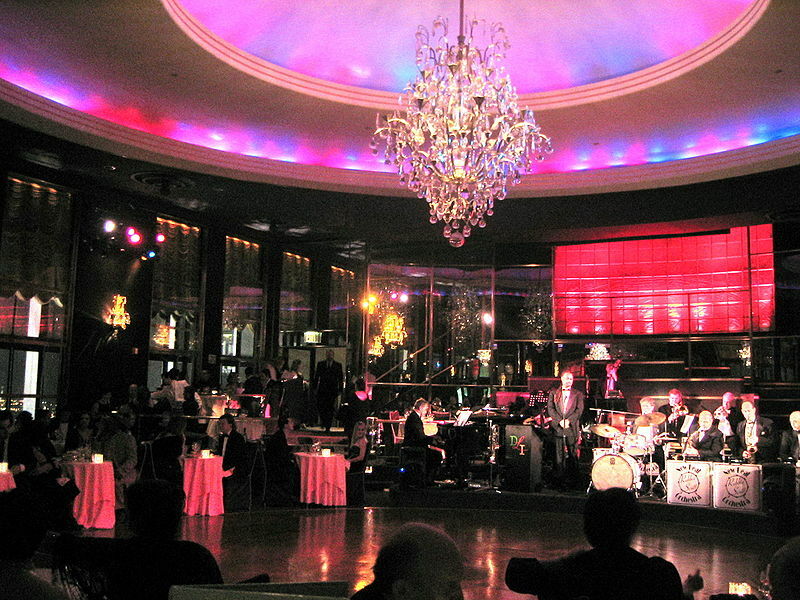 Caption: A modern band plays in the Rainbow Room. 1936: An ice-skating rink is added to encourage shoppers and tourists to visit the inner part of the plaza. Urban legend has it that the idea came from a skate salesman pitching his business by skating along the frozen bed of a fountain. 1936: Atlas sure isn’t shrugging on Fifth Ave.: This statue is constructed by Lee Lawrie and Rene Chambellan. 1940: The core of the complex is finally completed; 14 buildings have been built as well as a six-level underground parking garage. 1941: The promenade is transformed, transplanting crab-apple trees and replacing them with chrysanthemum blooms. 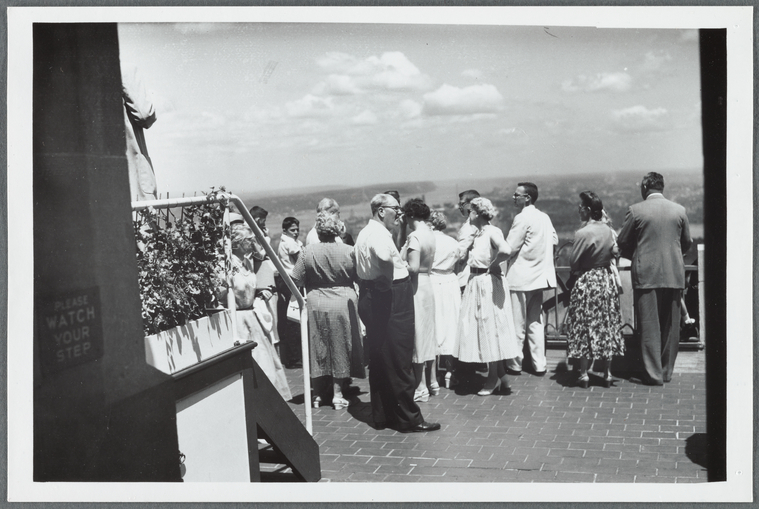 Caption: Tourists admire the view from Rockefeller Center in 1956. 1947: Another structure is added to the Rockefeller Center building history: 75 Rockefeller Plaza, also called the Esso Building. 1974: Four more buildings are built as a part of a single project between 1958 and 1974: 1211, 1221, 1251, and 1271 Avenue of the Americas. 1987: Rockefeller Center is named a National Historic Landmark. It is considered one of the greatest art deco projects of the Great Depression. 1988: The RCA Building at 30 Rockefeller Plaza, likely the center’s most famous building, is renamed the GE Building when it changes ownership. 2006: The sitcom 30 Rock debuts. It’s a satirical show by Tina Fey describing her work as a writer on Saturday Night Live at NBC, and it’s named after a common nickname for the building at 30 Rockefeller Plaza, which is where SNL is filmed. 2007: Instead of being recycled, the Christmas tree at Rockefeller Center is used for lumber, given to Habitat for Humanity to become part of one of their homes, a tradition that continues to this day. Amid the Great Depression, in 1931, demolition workers in the area where Rockefeller Center would be built pooled their money to buy a 20-foot-high Christmas tree, which they adorned with homemade garlands and even tin cans. It stood as a symbol of American persistence even during tough economic times. In 1933, a publicist was inspired by that first tree and decided to make this an official yearly tradition. 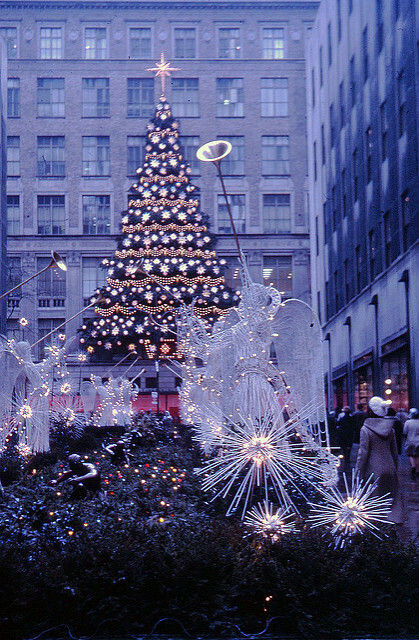 Caption: Angel decorations stand near the Rockefeller Center Christmas tree in 1970. While the trees were huge, they weren’t always dazzling: They remained unlit and undecorated during World War II in order to avoid using materials needed for the war effort. But most years, the tree has been lit, and since 1951, the Rockefeller Center tree-lighting ceremony has been televised by NBC. Today, the tree, typically a Norway Spruce that’s more than 70 feet tall, sports a star made out of LEDs and 3 million Swarovski crystals. The tree is flanked by angel sculptures created by artist Valerie Clarebout in 1969. There’s typically a great deal of excitement about the shipping of the giant tree through New York to its home at Rockefeller Center, and the extravagant Rockefeller tree-lighting ceremony now features performances by American celebrities. 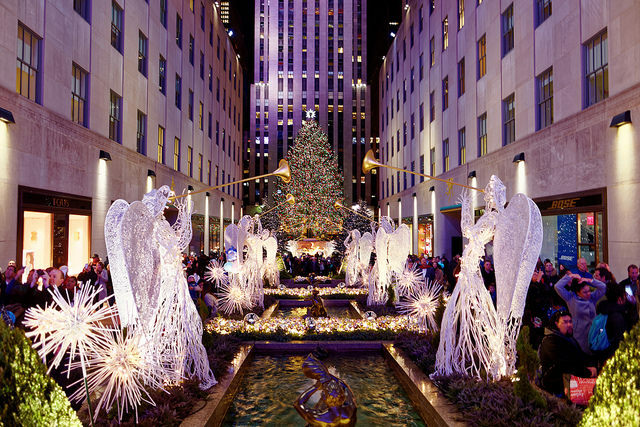 Millions of people either tune in or flock in to NYC to see the lightning of the Christmas tree at Rockefeller Center: History has shown that the number of tourists who visit to see the tree is usually about 125 million each year. Caption: Tourists skate at the famous Rockefeller Center rink. 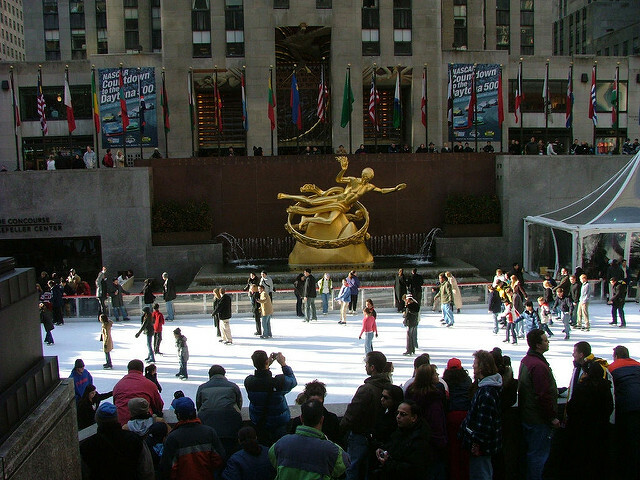 Another major attraction for visitors is The Rink at Rockefeller Center, NYC’s most famous and beloved ice-skating rink. A golden Prometheus overlooks the more than 150,000 people who skate along the rink’s surface every year. It is possibly the most filmed part of all of Rockefeller Center, staring in movies like Elf and shows like Saturday Night Live. While the rink is typically only open in New York’s winter months, the statues, shopping, and shows at Radio City Music Hall draw visitors all year long.